In the historic centre of Florence rises Palazzo Gamba, an ancient noble mansion transformed into several apartments of various sizes, such as to accommodate from 2 to 6 people. 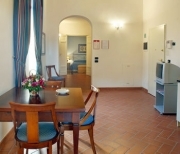 This tourist accommodation facility, opened in 2003, is located very close to the Cathedral, restaurants, shops, the numerous monuments of the Tuscan capital, all within walking distance. 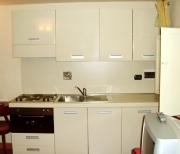 The two-roomed apartment of Palazzo Gamba in Florence is composed of living/kitchen, bedroom and bathroom (2 people). The apartment is well equipped with a refrigerator, oven and dishwasher, satellite TV, direct dial telephone, video intercom, air conditioning/heating, hairdryer and safe. The guests equipped with portable computers have the possibility of Internet analog connection (payment apart). The city has its own airport, the Amerigo Vespucci, located about 3 miles from the center of Florence. 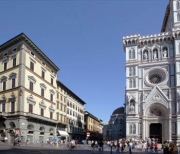 Airlines that fly to Florence include Alitalia, Air France, Austrian, Lufthansa, Swiss, Air Littoral, Carpatair, SNBrussels Airlines and Meridiana. If flying from North America, you will probably have to catch a connecting flight in Rome or Milan. The airport also has good connections to the center of the city, which can be reached in about fifteen minutes by taxi, and about twenty minutes by the Sita/Ataf service "Fly by Bus" between the airport and Santa Maria Novella railway station. Italy has an excellent train system connecting the entire country. High-speed train connections are available from other major cities, including Milan, Rome and Venice. You can check the train timetable online at www.trenitalia.com. The Santa Maria Novella train station is located in the center of Florence. Taxis are readily available at the train station. Many travelers may decide to rent a car to explore Tuscany. A car, however, is not very useful in Florence since most streets in the historic center can be only used by buses and taxis.